We will sustain value creation through execution excellence, technology innovation as well as financial discipline. Total assets increased by $0.3b to $29.2b. The increase in non‑current assets was partially offset by decrease in current assets. Total distribution to shareholders of the Company and non‑controlling shareholders of subsidiaries for the year amounted to $622 million. In 2016, the Offshore & Marine (O&M) Division secured about $500 million worth of new orders. Its net orderbook, excluding the Sete rigs, stands at $3.7 billion in end‑2016. Faced with the global offshore sector downturn, the Division is rightsizing its operations for what is expected to be an extended slowdown. The Division will continue to focus on delivering its projects well, exploring new markets and opportunities, investing prudently in R&D and building new capabilities to position itself for the upturn. The Division is also actively capturing opportunities in the growing gas market and exploring ways to re‑purpose its technology for the offshore industry for other uses. The Property Division sold about 5,720 homes in 2016, comprising about 3,800 in China, 1,520 in Vietnam and 380 in Singapore. This is about 25% higher than the 4,570 homes sold in 2015. Sales have improved in China, Vietnam and Singapore. In addition, Keppel REIT’s office buildings in Singapore and Australia continued to maintain high occupancy of 99.2% as at end‑2016. The Property Division will remain focused on strengthening its presence in its core and growth markets, while seeking opportunities to unlock value and recycle capital. In the Infrastructure Division, Keppel Infrastructure will continue to build on its core competencies in the energy and environmental‑related infrastructure businesses to pursue promising growth areas. On 20 January 2017, Keppel Infrastructure signed a 25‑year Water Purchase Agreement with Public Utilities Board (PUB), the national water agency, for Singapore’s fourth desalination plant at Marina East. Keppel Telecommunications & Transportation (Keppel T&T) will continue to develop its data centre business locally and overseas. Besides building complementary capabilities in the growing e‑commerce business, Keppel T&T plans to transform the logistics business from an asset‑heavy business to a high performing asset‑light service provider in urban logistics. In the Investments Division, the formation of Keppel Capital will allow the Group to more effectively recycle capital and expand its capital base with co‑investments, giving the Group greater capacity to seize opportunities for growth without putting a strain on our balance sheet. Keppel Capital will create value for investors and grow the Group’s asset management business. The Group will continue to execute its multi‑business strategy, capturing value by harnessing our core strengths and growing collaboration across divisions to unleash potential synergies, while being agile and investing for the future. Return on Equity (ROE) decreased to 6.9% in 2016 from 14.2% in the previous year, due to lower profits and higher average total equity. The Company will be distributing a total cash dividend of 20.0 cents per share for 2016, comprising a proposed final cash dividend of 12.0 cents per share and the interim cash dividend of 8.0 cents per share distributed in the third quarter of 2016. 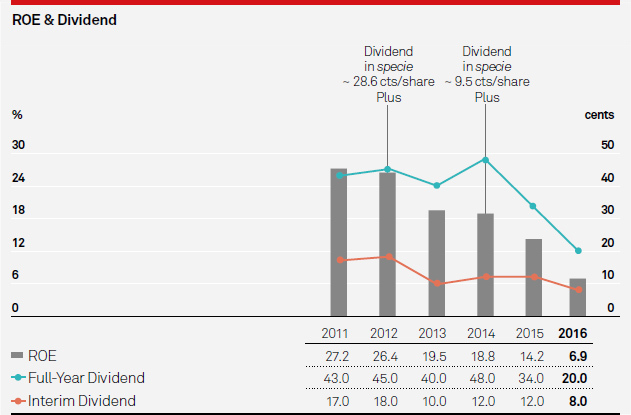 Total cash dividend for 2016 represents 46% of Group net profit. On a per share basis, this translates into a gross yield of 3.5% on the Company’s last transacted share price of $5.79 as at 31 December 2016. In 2016, Economic Value Added (EVA) decreased by $788 million to negative $140 million. This was attributable to lower net operating profit after tax and higher capital charge. Capital charge increased by $22 million as a result of higher Average EVA Capital, partly offset by lower Weighted Average Cost of Capital (WACC). WACC decreased from 5.88% to 5.82% in 2015, mainly due to a decrease in beta, partly offset by higher cost of debt. Average EVA Capital increased by $561 million from $18.56 billion in 2015 to $19.12 billion in 2016, mainly due to higher borrowings. Profit after tax excludes net revaluation gain on investment properties. The reported current tax is adjusted for statutory tax impact on interest expenses. Average EVA Capital Employed is derived from the quarterly averages of net assets, interest‑bearing liabilities, timing of provisions, present value of operating leases and other adjustments. Pre-tax Cost of Debt at 2.45% (2015: 1.76%) using 5‑year Singapore Dollar Swap Offer Rate plus 45 basis points (2015: 45 basis points). For FY 2014, capital charge on surplus cash of $1,939 million was at the concession rate of 2.93% instead of WACC of 6.45%. This was due to the	accumulation of surplus cash resulting from the advanced borrowing programme. Group shareholders’ funds increased from $11.10 billion as at 31 December 2015 to $11.66 billion as at 31 December 2016. The increase was mainly attributable to retained profits for FY 2016 and increase in fair value on cash flow hedges. This was partially offset by payment of final dividend of 22.0 cents per share in respect of financial year 2015 and interim dividend of 8.0 cents per share in respect of the first half year ended 30 June 2016 and foreign exchange translation losses. Group total assets of $29.23 billion as at 31 December 2016 was $0.3 billion or 1% higher than the previous year end. Increase in non‑current assets was partially offset by decrease in current assets. 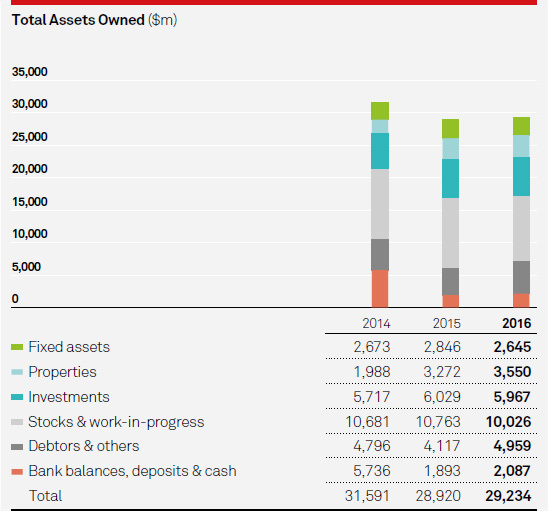 The increase in non‑current assets was due mainly to an increase in receivables, additions and fair value gains on investment properties in 2016, partly offset by the depreciation and impairment of fixed assets. Investments in associated companies decreased due largely to the dividends received and impairment losses, partly offset by acquisitions and further investments in associated companies. The decrease in current assets was due mainly to the lower stocks & work‑in‑progress (WIP) from the Property Division, and impairment of stocks & WIP in the O&M Division. This was partly offset by higher debtors and bank balances due mainly to higher billings in the O&M and Property divisions. Group total liabilities of $16.90 billion as at 31 December 2016 was $0.09 billion or 1% lower than the previous year end. This was mainly due to the lower billings on WIP in excess of related costs in the O&M Division and a reduction in derivative liabilities, partially offset by increased bank borrowings for working capital requirements and operational capital expenditure. Group net debt of $6.97 billion was $0.60 billion higher than that as at 31 December 2015. This was due mainly to dividend payments (by the Company and its listed subsidiaries), the acquisition of Cameron’s offshore product division, acquisitions of further investments in associated companies in the Property Division, as well as other operational and capital expenditure cash requirements. These were partly offset by proceeds from the disposal of subsidiaries in the Property Division as well as dividends received from investments and associated companies. 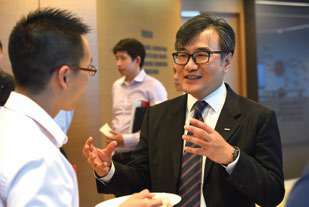 Keppel is committed to deliver value to shareholders through earnings growth. Towards achieving this, we will rely on our multi‑business strategy and core strengths to build on what we have done successfully, as well as seize new opportunities when they arise. Our 2016 Total Shareholder Return (TSR) of negative 6.3% was 10.0 percentage points below the benchmark Straits Times Index’s (STI) TSR of positive 3.8%. Our 10‑year annualised TSR growth rate of 1.8% was also lower than STI’s 2.8%. To better reflect our operational free cash flow, the Group had excluded expansionary acquisitions (e.g. investment properties) and capital expenditure (e.g. building of new logistics or data centre facilities), meant for long‑term growth for the Group, and major divestments. Net cash from operating activities was $330 million for 2016 as compared to net cash used in operating activities of $785 million for 2015. This was due mainly to the slowdown in working capital increases, and lower operational capital expenditure from the O&M Division. After excluding expansionary acquisitions, capital expenditure and major divestments, net cash from investment activities was $246 million. The Group spent $214 million on investments and operational capital expenditure, mainly for the O&M and Property divisions. After taking into account the proceeds from divestments and dividend income of $460 million, the free cash inflow was $576 million. The Group operates internationally and is exposed to a variety of financial risks, comprising market risk (including currency risk, interest rate risk and price risk), credit risk and liquidity risk. Financial risk management is carried out by the Keppel Group Treasury Department in accordance with established policies and guidelines. These policies and guidelines are established by the Group Central Finance Committee and are updated to take into account changes in the operating environment. This committee is chaired by the Chief Financial Officer of the Company and includes the Chief Financial Officers of the Group’s key operating companies and Head Office specialists. The Group has receivables and payables denominated in foreign currencies viz US dollars, European and other Asian currencies. Foreign currency exposures arise mainly from the exchange rate movement of these foreign currencies against the Singapore dollar, which is the Group’s measurement currency. The Group utilises forward foreign currency contracts to hedge its exposure to specific currency risks relating to receivables and payables. The bulk of these forward foreign currency contracts are entered into to hedge any excess US dollars arising from the O&M contracts based on the expected timing of receipts. The Group does not engage in foreign currency trading. The Group hedges against price fluctuations arising from purchase of natural gas that affect cost. Exposure to price fluctuations is managed via fuel oil forward contracts, whereby the price of natural gas is indexed to benchmark fuel price indices of High Sulphur Fuel Oil (HSFO) 180‑CST and Dated Brent. The Group hedges against fluctuations in electricity prices arising from its daily sales of electricity. Exposure to price fluctuations is managed via electricity futures contracts. The Group maintains a mix of fixed and variable rate debt/loan instruments with varying maturities. Where necessary, the Group uses derivative financial instruments to hedge interest rate risks. These may include cross currency swaps, interest rate swaps and interest rate caps. The Group maintains flexibility in funding by ensuring that ample working capital lines are available at any one time. The Group adopts stringent procedures on extending credit terms to customers and the monitoring of credit risk. The Group borrows from local and foreign banks in the form of short‑term and long‑term loans, project loans and bonds. Total Group borrowings as at the end of 2016 were $9.1 billion (2015: $8.3 billion and 2014: $7.4 billion). 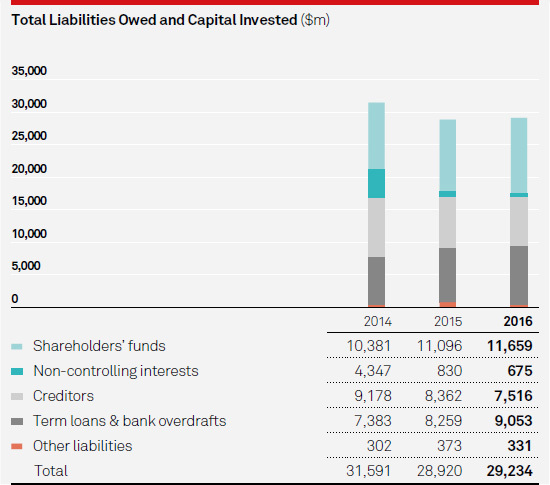 At the end of 2016, 20% (2015: 10% and 2014: 24%) of Group borrowings were repayable within one year with the balance largely repayable more than three years later. Unsecured borrowings constituted 87% (2015: 85% and 2014: 86%) of total borrowings with the balance secured by properties and other assets. Secured borrowings are mainly for financing of investment properties and project finance loans for property development projects. The net book value of properties and assets pledged/mortgaged to financial institutions amounted to $2.81 billion (2015: $2.46 billion and 2014: $2.70 billion). Fixed rate borrowings constituted 56% (2015: 65% and 2014: 66%) of total borrowings with the balance at floating rates. The Group has cross currency swap and interest rate swap agreements with notional amount totalling $1,678 million whereby it receives foreign currency fixed rate (in the case of the cross currency swaps) and variable rates equal to SOR, LIBOR and SHIBOR (in the case of interest rate swaps) and pays fixed rates of between 1.27% and 4.90% on the notional amount. Details of these derivative instruments are disclosed in the notes to the financial statements. 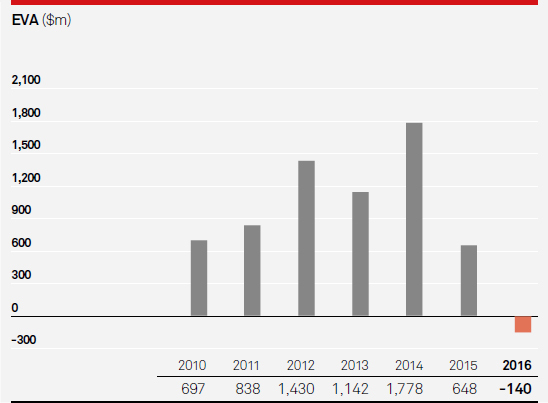 Singapore dollar borrowings represented 68% (2015: 65% and 2014: 65%) of total borrowings. The balances were mainly in US dollars and Renminbi. Foreign currency borrowings were drawn to hedge against the Group’s overseas investments and receivables, that were denominated in foreign currencies. Weighted average tenor of the loan book was around five years at the beginning of 2016 and around four years at the end of 2016 with a decrease in average cost of funds. The Group maintains a strong balance sheet and an efficient capital structure to maximise return for shareholders. Every new investment will have to satisfy strict criteria for return on investment, cash flow generation, EVA creation and risk management. New investments will be structured with an appropriate mix of equity and debt after careful evaluation and management of risks. Total equity as at end‑2016 was $12.33 billion, compared to $11.93 billion as at end‑2015 and $14.73 billion as at end‑2014. The Group was in a net debt position of $6,966 million as at end‑2016, which was above the $6,366 million as at end‑2015 and $1,647 million at the end‑2014. As at end‑2016, the Group’s net gearing ratio was 0.56 times, compared to 0.53 times as at end‑2015. Interest coverage was 15.35 times in 2014, decreasing to 9.66 times in 2015 and to 4.35 times in 2016. 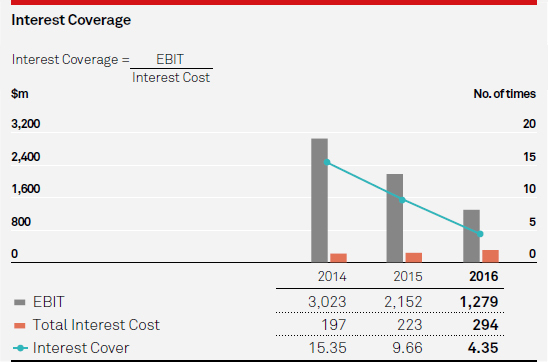 Interest coverage in 2016 was lower due to lower Earnings before Interest expense and Tax (EBIT) and higher interest costs. 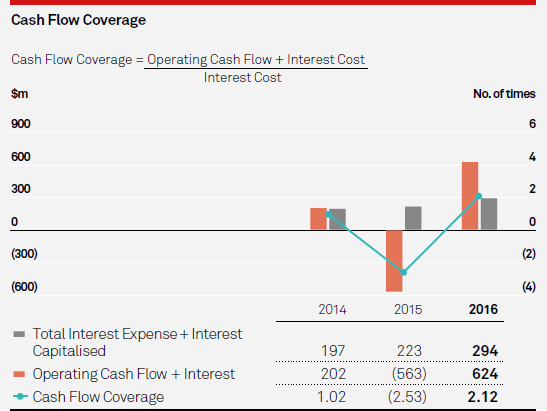 Cash flow coverage dropped from 1.02 times in 2014 to negative 2.53 times in 2015 before increasing to 2.12 times in 2016. This was mainly due to operational cash inflow in 2016. At the Annual General Meeting in 2016, shareholders gave their approval for mandate to buy back shares. During the year, 590,000 shares were bought back and held as treasury shares. The Company also transferred 5,120,470 treasury shares to employees upon vesting of shares released under the KCL Share Plans and Share Option Scheme. As at the end of the year, the Company had 2,232,510 treasury shares. Except for the transfer, there was no other sale, transfer, disposal, cancellation and/or use of treasury shares during the year. The Group continues to be able to tap into the debt capital market at competitive terms. As part of its liquidity management, the Group has built up adequate cash reserves and short‑term marketable securities, as well as sufficient undrawn banking facilities and capital market programme. Funding of working capital requirements, capital expenditure and investment needs was made through a mix of short‑term money market borrowings and medium/ long‑term loans and bonds and through the equity capital market. The Group maintains flexibility in funding by ensuring that ample working capital lines are available at any one time. Cash flow, debt maturity profile and overall liquidity position is actively reviewed on an ongoing basis. As at end‑2016, total funds available and unutilised facilities amounted to $8.71 billion (2015: $8.86 billion). The Group’s significant accounting policies are discussed in more detail in the notes to the financial statements. The preparation of financial statements requires management to exercise its judgment in the process of applying the accounting policies. It also requires the use of accounting estimates and assumptions which affect the reported amounts of assets, liabilities, income and expenses. Critical accounting estimates and judgment are described below. The Group assesses at each balance sheet date whether there is any objective evidence that a loan and receivable is impaired. The Group considers factors such as the probability of insolvency or significant financial difficulties of the debtor and default or significant delay in payments. When there is objective evidence of impairment, the amount and timing of future cash flows are estimated based on historical loss experience for assets with similar credit risk characteristics. The carrying amounts of trade, intercompany and other receivables are disclosed in the balance sheet. As at 31 December 2016, the Group had credit risk exposure to an external group of companies for receivables that are past due. Management has considered any changes in the credit quality of the debtors, the possibility of discontinuance of the projects and the cost incurred to‑date when determining the allowance for doubtful receivables and its expected loss. Management performs on‑going assessments on the ability of its debtors to repay the amounts owing to the Group. These assessments include the review of the customers’ credit‑standing and the possibility of discontinuance of the projects. The Group follows the guidance of FRS 39 in determining whether available‑for‑sale investments are considered impaired. The Group evaluates, among other factors, the duration and extent to which the fair value of an investment is less than its cost, the financial health of and the near‑term business outlook of the investee, including factors such as industry and sector performance, changes in technology and operational and financing cash flows. The fair values of available‑for‑sale investments are disclosed in the balance sheet. Determining whether the carrying value of a non‑financial asset is impaired requires an estimation of the value in use of the cash‑generating units. This requires the Group to estimate the future cash flows expected from the cash‑generating units and an appropriate discount rate in order to calculate the present value of the future cash flows. The carrying amounts of fixed assets, investments in subsidiaries, investment in associates and joint ventures, investment properties and intangibles are disclosed in the balance sheet. The Group recognises contract revenue and contract cost based on the percentage of completion method. The stage of completion is measured in accordance with the accounting policy stated in Note 2(q). Significant assumptions are required in determining the stage of completion, the extent of the contract cost incurred, the estimated total contract revenue and contract cost and the recoverability of the contracts. In making the assumption, the Group evaluates by relying on past experience and the work of engineers. Revenue from construction contracts is disclosed in Note 22. Revenue arising from additional claims and variation orders, whether billed or unbilled, is recognised when negotiations have reached an advanced stage such that it is probable that the customer will accept the claims or approve the variation orders, and the amount that it is probable will be accepted by the customer can be measured reliably. The Group had previously entered into contracts with Sete Brasil (Sete) for the construction of six rigs for which progress payments from Sete had ceased since November 2014. During the financial year ended 31 December 2015, an expected loss of $228,000,000 was recognised, taking into consideration cost of completion, cost of discontinuance, salvage cost and unpaid invoices with regards to these rigs. In April 2016, Sete filed for bankruptcy protection and its authorised representatives had been in discussion with the Group on the eventual completion and delivery of some of the rigs. As at the balance sheet date, management had performed an evaluation of the reasonably possible outcomes on these contracts and concluded that no further loss on these contracts is currently expected. As at 31 December 2016, the Group had several rigs/vessels that were under construction for customers or had been completed and were awaiting delivery to the customers. With the downturn in the offshore industry, some of the Group’s customers had requested for amendments to contract terms or deferral of delivery dates of the rigs/vessels. Management assesses each construction project individually to ensure that the recognition of revenue and margin on these projects is appropriate, and the related WIP (cost in excess of billings) balances are recoverable. This assessment requires management to make judgment as to whether the Group’s customers will be able to fulfil their contractual obligations and take delivery of the rigs/vessels at the contracted or revised delivery date. The Group has exposure to income taxes in numerous jurisdictions. Significant assumptions are required in determining the provision for income taxes. There are certain transactions and computations for which the ultimate tax determination is uncertain during the ordinary course of business. The Group recognises liabilities for expected tax issues based on estimates of whether additional taxes will be due. Where the final tax outcome of these matters is different from the amounts that were initially recognised, such differences will impact the income tax and deferred tax provisions in the period in which such determination is made. The carrying amounts of taxation and deferred taxation are disclosed in the balance sheet. The Group entered into various contracts with third parties in its ordinary course of business and is exposed to the risk of claims, litigations, latent defects or review from the contractual parties and/or government agencies. These can arise for various reasons, including change in scope of work, delay and disputes, defective specifications or routine checks etc. The scope, enforceability and validity of any claim, litigation or review may be highly uncertain. In making its judgment as to whether it is probable that any such claim, litigation or review will result in a liability and whether any such liability can be measured reliably, management relies on past experience and the opinion of legal and technical expertise.